Greenwich resident Harold Tananbaum, owner of Greentree Toyota in Danbury, Conn., stands among a row of fuel-efficient Prius cars on his lot on Wednesday, April 11, 2018. Harold Tananbaum sees the controversial subject of emissions and fuel economy standards as a story with two sides. The Greenwich resident and owner of Greentree Toyota in Danbury does not like the government regulating business, but he also feels strongly about the auto industry’s role in helping to protect the environment. That’s why Tananbaum neither cheered nor jeered the April 2 announcement by EPA Administrator Scott Pruitt that he would revise the Obama-era gas mileage standards that would have required cars and light trucks to average 54.5 miles per gallon by the year 2025. Pruitt said the standards did not “comport with reality.” He did not specify new targets. The announcement was seen as a big win for the auto industry, but Tananbaum doesn’t necessarily see it that way. James Fleming, president of the Connecticut Automotive Retail Association, withheld judgment on the announcement because Connecticut is a CARB, or California Air Resources Board, state and the future remains murky. Since the 1960s, California has had an exemption under the Clean Air Act to set its own vehicle emissions standards, which are typically more stringent than the federal standards. Connecticut is one of 13 other states — including all New England states except New Hamphsire — to follow CARB standards. A news release issued by the EPA last week said California’s wavier is “being re-examined,” setting the stage for legal and political battles. “Consumers want cleaner and more affordable vehicles, so we’ll see what happens,” said Fleming, whose organization represents more than 270 dealerships. 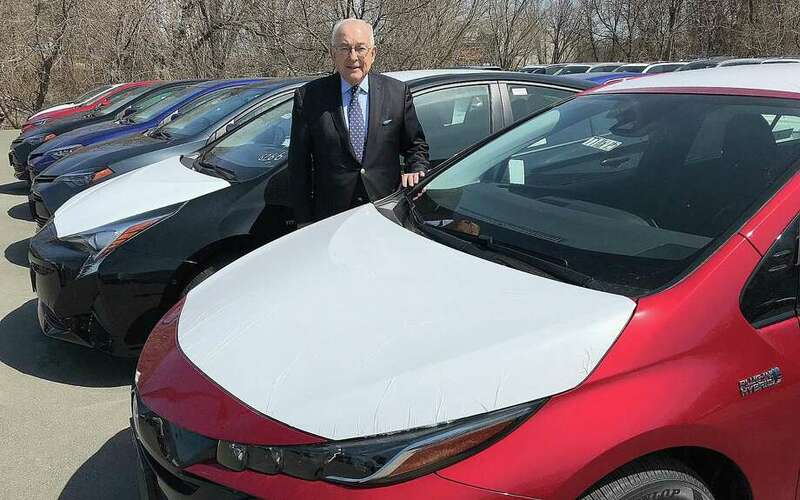 Fleming said Connecticut has been at the forefront of encouraging consumers to purchase electric- and hydrogen-powered vehicles by offering immediate and generous rebates. Pruitt’s announcement, not surprisingly, was met with consternation in the state’s capital. Gov. Dannel P. Malloy called it a failure of the Trump administration to properly lead on behalf of climate, energy and the environment. Malloy vowed to continue to work with California and other CARB states to protect the waiver provided by the Clean Air Act. “(We) look forward to a time when our federal government again allows science and not the demands of the auto industry to drive the important goals and objectives of the advanced clean cars program,” he said. Tananbaum poked holes in Malloy’s assertion the rollback would lead to more frequent stops at the gas station. Auto manufacturers, responding to consumer demand, have significantly improved the fuel economy of vehicles over the years and will continue to do so, regardless of government mandates, he said. Tananbaum opened Greentree Toyota 41 years ago. He said the average sedan back then averaged about 10 to 12 miles per gallon. Now they get about 30 miles per gallon. Even SUVs and small pickup trucks — the best-selling class of vehicle now — are making great strides to improve efficiency, he said. Toyota’s small SUV, the Rav4, averages about 25 miles per gallon. Tananbaum paused as he walked by a white Prius Prime in his showroom. The plug-in electric hybrid gets 133 miles per gallon when using electric and gas, and nearly 55 miles per gallon when it switches to gas only. Tananbaum said the Prius Prime and regular Prius are “perfect examples” of manufacturers being concerned about fuel efficiency. Nearly every manufacturer has electric vehicle options now, with improvements being made each year. The Chevy Volt, similar to the Prius Prime, is another plug-in electric hybrid that gets more than 100 miles per gallon when using electricity and gas combined. Fleming said there are 44 different types of electric or hydrogen vehicles available to Connecticut consumers. While Tananbaum praises the auto industry’s history of making improvements to fuel efficiency, he admits there is always room to get better.